Browse through our wonderful collection of thyme recipes, including Galton Blackiston's lemon thyme and mint ice cream, Paul Ainsworth's venison carpaccio, and Pascal Aussignac's pissaladière. Thyme comes in numerous varieties, but the most common in the kitchen are 'garden' thyme and lemon thyme, both of which can be purchased fresh or dried. 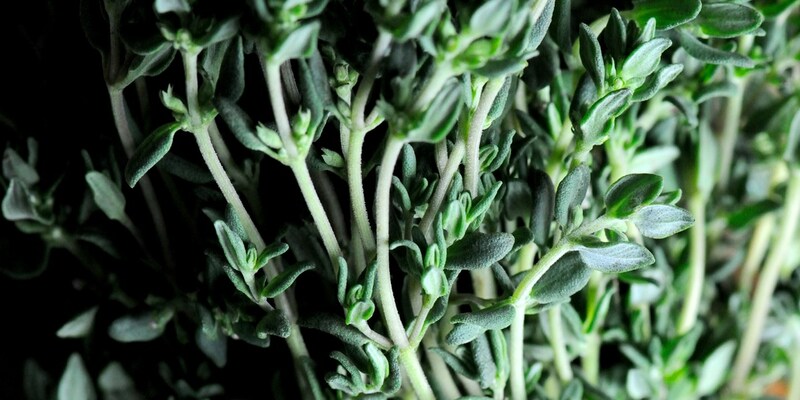 Fresh, whole sprigs of thyme are useful for adding to roasts and casseroles. Marcus Wareing uses this approach in his roast beef recipe, as does Tom Aikens' in his braised lamb. Dried thyme is also a handy friend to have in any kitchen pantry to add some extra flavour to an array of sauces, stews and soups. Fish dishes are an apt way to experience thyme in its Mediterranean guise. Try thyme in Nathan Outlaw's red mullet recipe with oven-dried tomatoes and fennel. Or go for Marc Dodson's salt cod recipe, where thyme features in the cod seasoning and its accompanying tomato vinaigrette. Thyme can also be used to add interest to puddings and is a surprisingly good match for fruit, particularly berries and stone fruits. Pascal Aussignac adds lemon thyme to his shortcrust pastry for a strawberry tart, while Robert Thompson combines thyme with peaches in his roast peaches recipe.